The world economy and businesses are growing - a sign from the latest world's top billionaires list released by Forbes Magazine research for 2013. 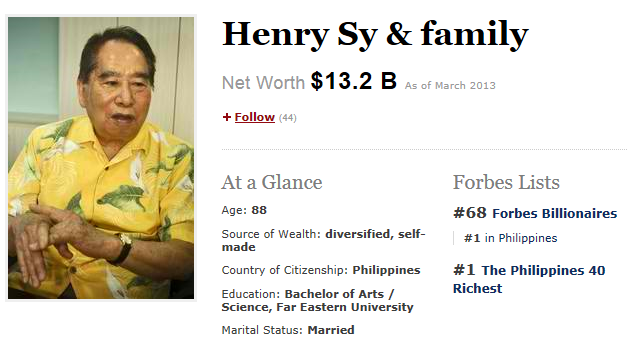 Among the richest people on planet are Filipino tycoons Henry Sy and Lucio Tan on 68th and 248th spot respectively. 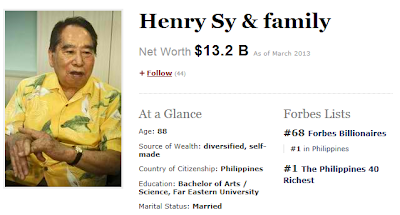 Henry Sy, the rich-man behind SM Investments and the undisputed leader in terms of shares and other financial records has a net worth swell from $9.1 billion in 2012 to $13.2 billion in 2013. Lucio Tan, owner of Philippine Airlines (PAL), Eton Properties Philippines, Philippine National Bank, Fortune Tobacco, Asia Brewery, Tanduay Holdings, Allied Bank and University of the East boasts his net worth of $5 billion, an increase of $500 million from 2012 figure. Enrique Razon Jr., owner of International Container Terminal Services has a net worth a little lower than Tan, $4.9 billion dollar made him 3rd richest Filipino and 258th billionaire in Forbes world's wealthiest list. The rank of worldwide billionaires was tallied by Forbes global wealth team. Forbes said that figures reached all-time high this year. "The 2013 Forbes Billionaires list now boasts 1,426 names, with an aggregate net worth of $5.4 trillion, up from $4.6 trillion. We found 210 new ten-figure fortunes. Once again the U.S. leads the list with 442 billionaires, followed by Asia-Pacific (386), Europe (366), the Americas (129) and the Middle East & Africa (103). ", Forbes.com said. Carlos Slim Helu, Mexican business magnate and investor is declared as the 2013 wealthiest person with net worth of $73 billion. Microsoft co-founder Bill Gates is ranked No. 2. for having $67 billion.